In 1965, Carly Sears becomes the physical therapist for an intriguing man who seems to know her. Five years later, as her brother-in-law, Hunter helps her find specialty medical care for her unborn baby—in the future. The events on 9/11 alter her course, causing her to make an agonizing decision regarding her daughter. Chamberlain carefully lays out the rules for time travel and sticks to them, allowing for the anomalies not yet worked out by Hunter and his scientist mother. 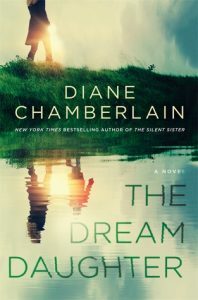 In her first foray into speculative fiction, this story remains pure Diane Chamberlain, with complex characters, dynamic relationships, and impossible choices. Within tension building to a near breakdown as revelations explode, Chamberlain’s characters make the right decisions for them, and the reader swoons. After dozens of novels in the literary genre, Chamberlain ventured a bit further into historical fiction, which worked out really well for her. Now tossing in a bit of fantasy / sci-fi proves her versatility. I was fortunate to receive an early copy of the newest book by one of my favorite authors directly from the publisher #St.Martin’sPress.